Sankai Juku, one of Japan’s leading Butoh companies, travels to Sadler’s Wells this month to present two contrasting works from their repertoire. Kinkan Shonen (Kumquat Seed) explores a boy’s dream about life and death using mystic imagery as dancers’ bodies slowly transform into a series of almost none human shapes, and a live peacock strolls the stage. 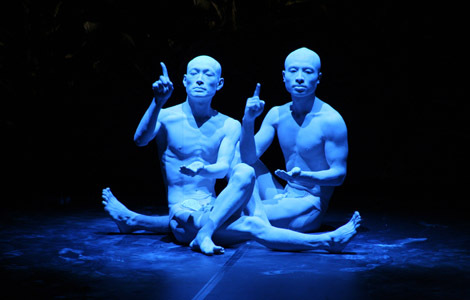 Toki (Time) is one of the company’s newest works and is a mesmerising example of contemporary Butoh dance. Performed by eight dancers on a stunning set that brings to mind elements of both science fiction and an ancient world. http://www.japancentre.com have been lucky enough to have been given a pair of tickets to watch Kinkan Shonen on Tuesday 18th November for 1 lucky online customer to win. All you have to do is place an order before Monday 17th November and you will automatically be placed into our Prize Draw!